來自美國三番市的Mission Bicycle Company 最新發行了這台可以在夜間100％反光車輪和車架的FIXIE， 就是讓在你在夜晚騎乘之中更為安全。他的亮度不只是反光而已，而是利用設計申請專利的3D塗漆使表面有相當程度的聚光效果，來看看影片吧，你就會更加明白囉! “Dark grey by day. 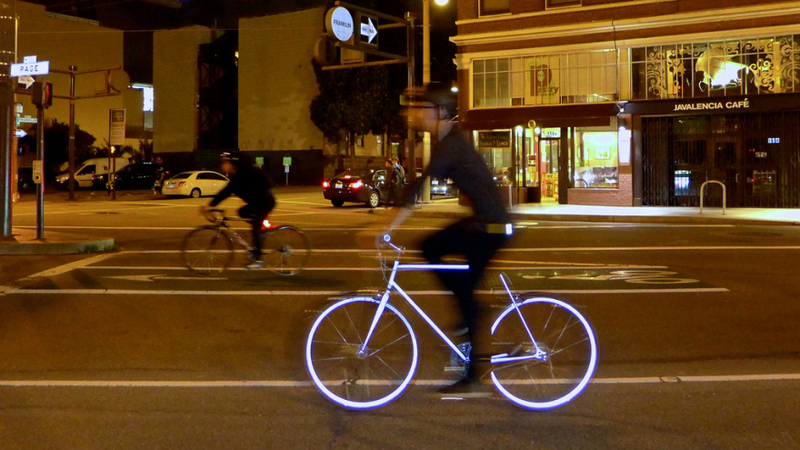 White by Night” San Francisco based Mission Bicycle Company design the Lumen cycle. 100% retro-reflective wheels and frame, the first of its kind, during night time rides light directed at the bike is sent right back to the source, cat-eyes style, rather than diffusing or scattering. The result is an intense glow announcing your arrival to drivers and pedestrians. An inconspicuous iridescent dark grey during the day, once the sun sets the bike lights up like a nightclub on wheels, hundreds of thousands of microscopic spheres getting to work to produce a glow visible at 1,000 foot. The patented design has allowed coating of 3D rather than 2D surfaces for the first time thanks to the guys at Halo Coatings, this new technique applied to three Mission frames, one single-speed and two geared. This fascinating design is now in its Kickstarter phase, for more head to the page to contribute or reserve your very own retro-reflective city bicycle. Press play.